Wash, shampoo and rinse hair in an upright position with this innovative hair shampoo funnel. Perfect for anyone who might have difficulty or discomfort using standard shampoo bowls or leaning over the tub, including individuals with neck or back issues, the disabled and the elderly. The easy-to-use hair wash shield diverts water into a sink or bowl without making a mess. A Velcro closure keeps the clear, flexible funnel in place. Designed and manufactured by Betty Dain, a beauty industry leader for more than 60 years. To use, attach along the hairline with the Velcro closure positioned by the forehead. Position funnel opening down toward sink, then wash and rinse hair. To use, attach along the hairline with the Velcro closure positioned by the forehead. Position funnel opening down toward sink, then wash and rinse hair. I chose this product because my mom is 91 years old and it's hard for her to lean over the sink. Family member has Muscular Dystrophy and cannot use normal means to wash hair. Hopefully this will enable me to wash their hair. I saw this and thought it would be handy to use while coloring hair...If not, oh well, I'll keep looking for something that prevents coloring from getting all over me and my clothes. I will be having eye surgery. I need to keep soap and water out of my eyes for several days. This is the only product made for adults that I have found. I am not able to get my head back to the sink - hopefully this will help. So that expensive kitchen counters & sink in our rented home wouldn't be stained by my/our frequently used hair coloring. Safety deposit! Saw in catalog that was sent to my house. I am disabled and this will make washing my hair easier for me and my daughter. When shampooing my hair it will be easier than bending my head over or bending my head all the way back. Purchased for elderly person who can no longer get into a shower. My husband is disabled and this will work out just great. I cant bend over the tub. Best price for an item we need (in all hope) only temporarily. To wash my hair without having to bend over in the sink. To try it on my husbands hair. Just what I have been looking for. It is hard to find. 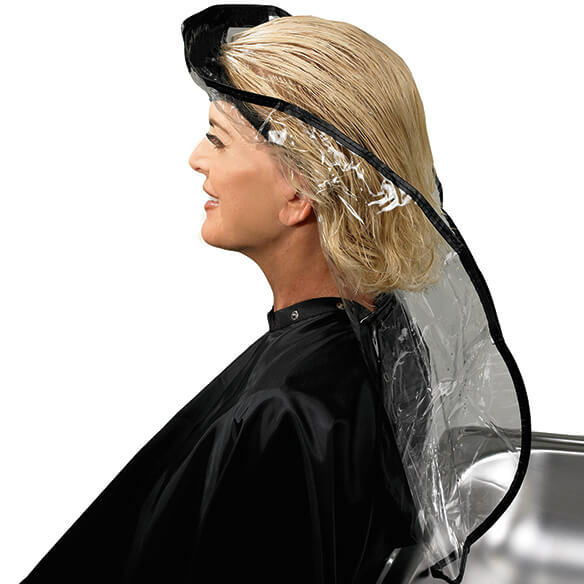 This item will make it possible to use the shampoo bowl at the hair salon. I am not able to bend my neck well. I will now have a dry blouse and the salon will have a dry floor. I'm a hairstylist and this is perfect for a client who cant lean back to wash their hair.